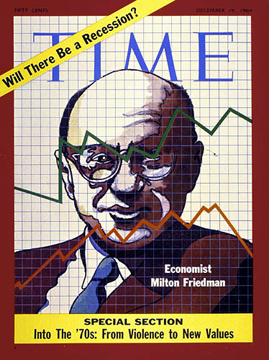 In his defence of Milton Friedman against the charge that he was an inflationist ("Milton the Inflationist?" September 3), Post columnist William Watson forgets a few crucial points. First, let's put this debate into a somewhat larger historical context. For thousands of years, money was gold. The pieces of paper that people used for convenience were simply a claim on a certain amount of gold, which physically cannot be expanded in any arbitrary fashion: You have to dig for it in the ground to increase the money supply. During that long period, prices were understandably stable most of the time. During some periods, as in the 19th century when classical liberalism was dominant and western economies grew quite rapidly, prices even went down. This is logically what should be happening when you have productivity increases and economic growth with a constant or very slowly growing amount of money. There is simply no theoretical foundation or empirical evidence to support Watson's claim that "If money didn't grow with the economy, it would become harmfully scarce." Prices will simply tend to go down. Price deflation is not the boogeyman that inflationists like Bernanke, Carney and almost all the economic establishment are trying to make us believe. It is the normal state of affairs in a growing economy where there isn't a central planning agency constantly depreciating the money we hold by creating tons more. During the past century, however, governments have taken over the management of money and gradually cut its link to gold. Today, money is a worthless piece of paper with a government stamp on it. Central banks can print or electronically create an infinite amount of it—something approaching this has indeed been going on lately in the U.S.
As Watson writes, J.P. Morgan only had to provide a few million during the 1907 crisis; today it's trillions. Why would that be? Because we've had an awful lot of inflation during the past century and a 1907 dollar is barely worth a few cents today. Anyone who supports this government-controlled fiat money system is basically an inflationist. Friedman was one of them. In fact, apart from a handful of supporters of Austrian economics, most of the conventional defenders of free markets in this country, in think tanks, academia and libertarian/conservative circles, are monetary statists. "Apart from a handful of supporters of Austrian economics, most of the conventional defenders of free markets in this country, in think tanks, academia and libertarian/conservative circles, are monetary statists." Contrary to what Watson writes, Friedman's view was not that "if you had a central bank (and maybe you needed one and maybe you didn't), it should control the rate of growth of the money supply." He advocated abolishing the Fed and transferring its powers to Treasury bureaucrats who would increase the money supply by a constant rate of about 3% to 5%. Government control plus a constant monetary inflation—in my book, that's called inflationism. Not just that, but fraud and robbery, since inflation is a transfer of wealth from actual holders of money to those who benefit from the money newly created. This is not just a theory; all economists know that this is the effect of inflation. Which is why it is simply amazing that anybody who supports giving the government the right to steal everyone by some fixed percentage every year could pretend with a straight face to be a consistent supporter of freedom and free markets. Watson also asks "whether you're an inflationist if you believe that during a panic the central bank should provide liquidity to the financial system." Of course you are. Chicago school economists have never understood that monetary inflation created the problem in the first place and so cannot be its cure. When there is an artificial boom brought about by too much money flowing around, as in the roaring twenties or the early years of this decade, these economists marvel at the stratospheric level of prices in inflated sectors and they defend the speculative excesses that are typical of these periods as necessary and beneficial aspects of capitalism. They have no concept of malinvestments, those activities that are not really profitable in the long term and are only sustained by more doses of fresh money. If you understand all this, however, you see that the boom has to come to an end and that there needs to be a readjustment of production to better conform to the reality of the market. You need to stop what you were doing that caused the problem and let markets find their equilibrium level. Flooding markets with "liquidity"—a nice buzzword that simply means monetary inflation—only prevents or slows this process. Panics would not happen if central banks did not irresponsibly boost the money supply in the first place (or if commercial banks did not do the same thanks to the fraudulent fractional reserve system, which did happen too before the Fed was created in 1913, leading to interventions by big money interests such as the Morgan house). So if, as Friedman and his disciples believe, there was no problem with the boom and you need to inflate even more during the bust, then yes, you are definitely an inflationist. This is not one of those exceptional moments when your usual support for low inflation has to be set aside because the circumstances warrant it—it is a time when the deleterious effects of having continually expanding fiat money should be even more evident and fought with even greater energy and eloquence. That's what Ron Paul and his Austrian colleagues have been doing in the U.S. They are real defenders of free markets, not flawed ones like Friedman. * This article was first published in the National Post on September 9, 2009. It is M. Masse's reply to an article by William Watson defending Milton Friedman against the charge of being an inflationist.